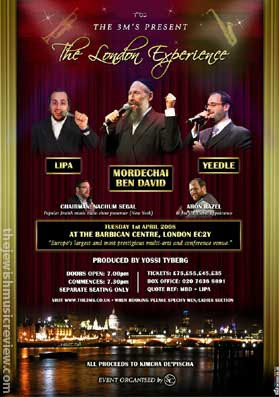 The 3M's Present The London Experiance .Produced by Yossi Tyberg Featuring Lipa Schmeltzer, Mordechai Ben David, Yeedle. Chairman Nachum Segal and Aron Razel in his UK Debut appearance. Tuesday April 1st 2008 at the Barbican Centre, London EC2Y. Doors open 7pm. Show begins 7:30pm Separate seating only! to order tickets visit www.the3ms.co.uk. Lipa has pulled out of this concert, in addition to his pull-out from The Big Event.